We are gearing up for round two of the Rock River Anything That Floats Race returning to the Rock River on Sunday, August 20, 2017 (rain date August 27) from 9:00 a.m. to 3:00 p.m. This 1.6 mile race on the Rock River begins at the north side of the Auburn Street Bridge (former coast guard station) and ends with a party at the Prairie Street Brewing Company following the race. 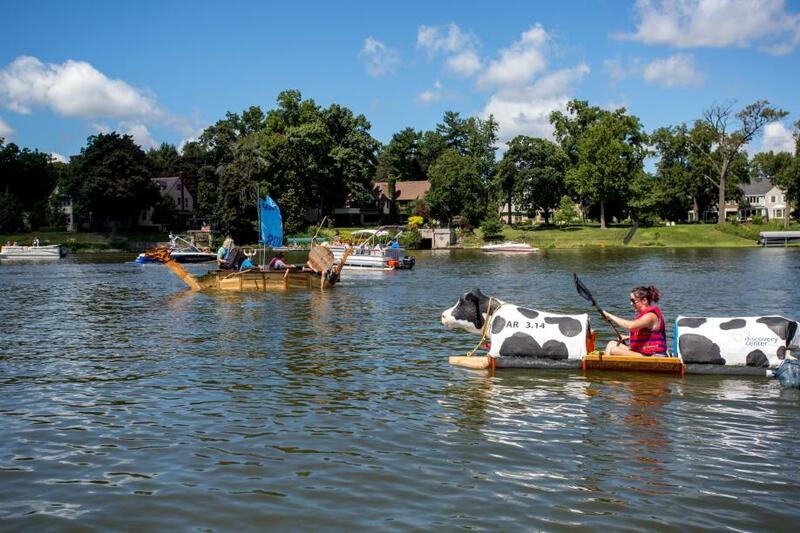 Teams can sign up to build their own makeshift raft or floating device for the main event and there will also be plenty of water set aside for canoes (doubles and singles), kayaks (doubles and singles), and paddleboards to race as well. Registration will open to the public on March 1st and the deadline to sign up is August 1, 2017. Participants can register for the race on the website at www.rratfr.com. More details will be added to the website and social media sites (Facebook, Twitter and Instagram) throughout the coming months. The Rock River Anything That Floats Race committee is pleased to announce that the first annual event in 2016 was a great benefit to the community. The event raised nearly $8,000 to benefit the Rockford Fourth of July and Holiday Lighting efforts, the Rock River Trail Initiative and the Ski Broncs. Initially launched in 1976 (U.S. Bicentennial) as a US. Vs. Brits race, after two years with only two teams, it was opened to the public. More than just an homage to the incredibly popular WROK/ZOK sponsored raft races of the ’70s, ’80s and ’90s - the all new Rock River Anything That Floats Race will be a brand new tradition for generations of Rockfordians to love and experience for years to come. More than just an homage to the incredibly popular sponsored raft races of the ’70s, ’80s and ’90s - the all new Rock River Anything That Floats Race will be a brand new tradition for new generations of Rockfordians to love and experience. Additional details can be found at www.rratfr.com.